We stopped to think about why this might be—here are five reasons that explain why your kitchen is the heart of your home. In a home, there are many private rooms that only certain family members tend to utilize on a regular basis. Maybe dad loves his office, and the kids their playroom. 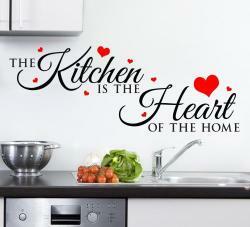 However, each member of the family utilizes the kitchen every day. In recent years, families have begun to adapt their kitchens to provide a more supportive environment in which to congregate. For example, family computers have started to make their way into kitchens so kids can work on their homework while dinner is being made and parents can check a few items off their to-do list while still being in the kitchen with their loved ones. Because of this shift in kitchen dynamics, it is important your kitchen space is designed to be welcoming and conducive for family members to congregate. People invest a lot into kitchen upgrades because it is the most important room when it comes to the resale value of the home. Kitchens set the tone for the entire house. They have the ability to not only provide a meal but a complete experience. An inspiring space can mean the difference between a mediocre day and a fantastic day. For those not looking to renovate the entire kitchen, small upgrades can go a long way. Changing the cabinets and/or countertops can significantly transform the mood in the kitchen.